In August, the Trump administration formally began its process of rolling back federal clean vehicles standards that would reduce fuel efficiency for cars and light-duty trucks from 54.5 mpg to 37.5 mpg by model year 2025. E2 is working hard across the country to point out the economic fallacy of this unwise rulemaking. Last week in Ohio and Michigan, E2 began running digital ads to educate consumers and others in these two key auto states on the savings and the increased job security for fuel efficiency workers and the advances in American innovation that would come with the stronger standards. Through the ads (see below for an example), viewers can submit formal comments to the Department of Transportation and the Environmental Protection Agency. 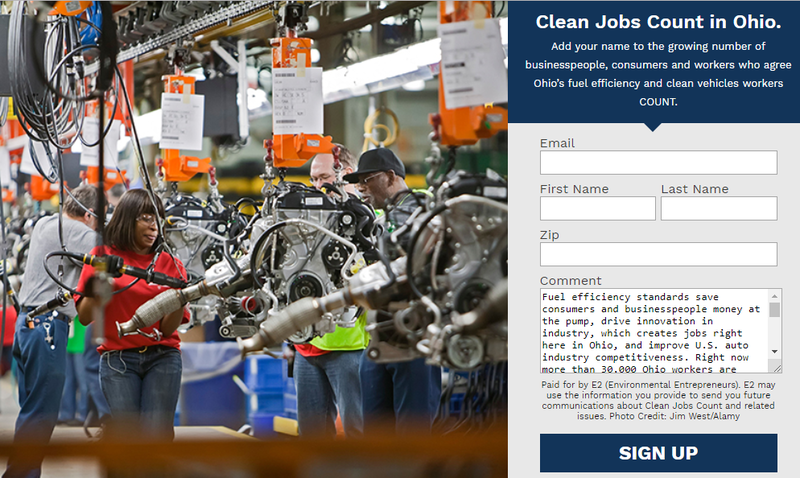 The ads are also tied to E2’s national Clean Jobs Countcampaign designed to raise awareness of the economic benefits of smart pro-jobs policies. Elsewhere, E2 staff and members will travel to Fresno, Ca., Pittsburgh, Pa. and Dearborn, Mich. over the next week to give formal testimony opposing the clean cars standard rollbacks. And in Washington, E2 members and supporters from Pennsylvania, Colorado and Virginia will accompany me and other E2 staff to meet with members of Congress next week about the importance of the clean car standards as well as other federal clean energy standards, during National Clean Energy Week(see more details below). In all of our work around clean car standards, we’re amplifying the voices of the 500+ E2 members and supporters like you who added their names to this national action alert we submitted as part our of our formal comments to the DOT and EPA. E2 Working to Stop Misguided Clean Cars Standards Rollback was originally published in e2org on Medium.